This is a important book in my childhood collection. I had a few issues of this series when I was younger, which reprinted the early issues of The Amazing Spider-Man by Stan Lee and Steve Ditko. When I first read it, I thought it was dated. The art looked cartoony. I was used to the Todd McFarlane/Mark Bagley style that was popular at the time. When I read the book and the other issues that I had when I got a little older, (middle school age) I found myself connecting to Peter Parker in ways that I never did in the more contemporary issues. Episode 24 of the sought-after 60's original animated series! Early Peter Parker is loser high school student. I was a loser junior high school student. He lived in Queens. I lived in the Bronx. Peter inexplicably went to school in Manhattan while wearing a shirt and tie. I went to school in Manhattan while wearing a shirt and tie. He was terrible with girls. I was terrible with girls. I identified with Peter Parker in a way that I had never before. He quickly became my favorite superhero and still is now that I’m in my early 30’s and it’s because I had access to the early Lee/Ditko books. *Originally printed in "Amazing Spider-Man #9"
I love the splash pages that open most Silver Age Marvel books. The story begins with a great sequence of Spider-Man swinging through the city. Bystanders assume he must be headed to an emergency, he swings right past a firefight between some gangsters and the police, The bad guys to surrender rather than face Spidey, but he goes right by. In a little more than one page the reader goes from thinking Spidey, will stop a robbery, to thinking he must be chasing a bigger bad guy, to finally, he just wants to get medicine to his sick Aunt. It's great storytelling and tells the reader so much about Peter Parker. As Peter sits by his Aunt’s bedside, worried about her future we meet Electro who robs an armored car. We then cut back to Peter, who learns that his Aunt’s condition is deteriorating and she needs to be admitted to the hospital. Peter worries about how they’re going to pay for the hospital bill, and takes off as Spider-Man hoping to get a few pictures but calls off the battle against crime due to rain. Perhaps the first time we see a superhero doing laundry. 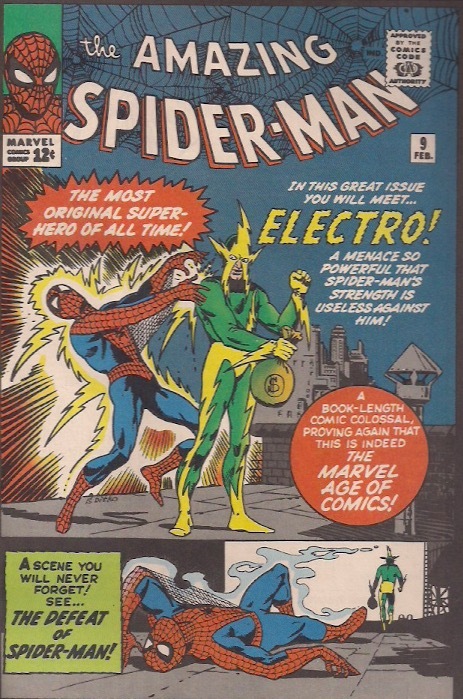 Electro earns the attention of J. Jonah Jameson by robbing a bank while he’s inside. As Jameson exits the bank he sees Spider-Man swinging by overhead and concludes the only natural thing, Electro is Spider-Man! When in doubt, blame Spider-Man! Peter asks for a loan of $1000 from Jameson to help pay Aunt May’s bills, without telling JJJ what it’s for. He refuses but offers the money if Peter can get pictures proving that Spider-Man is Electro. Spider-Man confronts Electro only to touch him and get zapped but it give Peter the footage to doctor some pictures to earn some money. Electro’s next master plan is to bust out prisoners from the local jail. As Electro opens the electric locks, Aunt May is wheeled into surgery. Peter leaves his Aunt’s side puts on some rubber boots and gloves. Now that Spidey is safe from the electricity, he turns the hose on Electro, shorting him out and gets some spectacular pictures in the process. Peter and JJJ, wind up calling a truce over the doctored photos, since Peter captured the real fight on film. You don’t need to get this book for your collection but you should read the story if you’re a fan of Spider-Man. Nowadays, the whole original run is collected in the trades. There’s no real reason to collect a 22-year-old reprint if a single issue. I loved the story. I loved how Peter’s main concern throughout the story was his Aunt, not Electro. After he wakes up from being zapped, his first concern is the pictures because Aunt May needs surgery. She's always on the back of his mind and he can't commit fully to Electro until he knows she's in surgery and it's paid for. Early Spider-Man stories and I think what makes the Spider-Man such a great character is the story outside of the costume is more interesting than the story in the costume. Peter’s concerns at school, with Aunt May’s illness, with Betty Brant, and his job at the Bugle all take center stage over the battle with Electro which is kind of a formality. Ditko does so much with the few pages he has. If you’re a fan of comics and Spider-Man, you should read as many of the Stan Lee and Steve Ditko stories as you can. This book's a graveyard smash! We stick with the Lee/Ditko era Spider-Man, but with a 90’s twist. Kurt Busiek fills in the blanks between the early issues of the Amazing Spider-Man with the Untold Tales of Spider-Man! It’s Spider-Man vs. The Lizard in the Untold Tales of Spider-Man # 9! See you next week!